St. Mary's Malankara Orthodox Syrian Church was established on January 1st, 1980, as per the constitution of the Malankara Orthodox Syrian Church, by the Kalpana of His Grace Dr. Thomas Mar Makarios, then the American Diocese Bishop. Our first location was at 12th and Oak Lane in Philadelphia, PA This location was a rented hall of a Ukrainian Orthodox Church. Our first Vicar was M.E. Idiculla Cor Episcopa and at that time we only had sixteen families as members. When we started we only had Holy Qurbana and Prayer meetings once a month. However all the members gathered at the church every Sunday and we held Morning Prayers, Bible reading along with Sunday School and Martha Mariam Samajam. Very Rev. M. E. Idiculla served as our Vicar from January 01, 1980 to January 31, 1983. Rev. Fr. C.J. Johnson came to our parish in end of 1981 and we started regular Holy Qurbana every Sunday in 1982. On February 1983, Rev. Fr. C.J. Johnson became our Vicar as per the Kalpana of His Grace Dr. Thomas Mar Makarios and he continues to be our Vicar today. Our church has also had a "church picnic" and "church trip" every year since the beginning. We have also conducted Retreat, Vacation Bible Class, Convention and Church Perunal every year under the leadership of our Vicar. 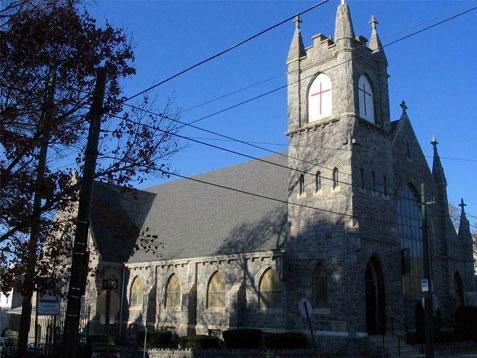 On March 18, 1988 we acquired the present church at 1424 Orthodox Street in Philadelphia. We built three beautiful altars in the church by the artist Mr. Tiruvalla Baby. The sanctification ceremony was held on 29th and 30th of April 1988, by his Grace Dr. Thomas Mar Makarios and the late His Grace Dr. Paulose Mar Gregorios. Since the inception of this Church, we have participated in charitable work within the USA and abroad, such as helping sick people, housing for homeless, marriage assistance, and tuition assistance, through the mother church in India. Our church has always worked with the American Diocese and His Grace Dr. Thomas Mar Makarios. Very Rev. M. E. Idiculla and Very Rev. C. J. Johnson have held secretary positions in our American Diocese and the late Mr. M.M. Koshy and V.C. George served as Council Members for our Diocese. Our Late Catholicos His Holiness Moran Mar Baselios Mathewes II visited our parish and conducted Holy Qurbana. During his visit His Holiness while praising the church made a comment to the entire congregation to the effect of that he has never seen such a beautiful church outside of India. Our current Catholicos His Holiness Mar Baselios Marthoma Didymos I visted our parish in 2006 for evening prayer. In addition many other Bishops and Priests of the Malankara Orthodox Church have visited and conducted Holy Qurbana for us.